Keeping up with regulations for waste management can be quite challenging and not having all the required information can result in paying huge fines. Disposing of waste properly is a major concern in countries all over the world as there is more awareness and worry about the damage done to the environment. So how can you avoid fines brought on by improper management of waste? Well, the solution is easy as all you require is a little time and effort. The best thing about it is that you can hire professional waste disposal services in London to ensure that your waste is managed according to the regulations in your area. 1. Do not dump waste into sewer systems: This is a tip that is simple yet you will find that many households and businesses that practice it. Dumping waste, especially hazardous ones, is a violation that can cost you a high price. With advanced technology, waste can be traced back to you so contrary to what you may think, you can be found out and made to pay a heavy fine. 2. Cover waste containers: It is important to make sure that you cover all your waste collection containers properly. This prevents foul odor from emanating and spillage. When professional waste disposal services in London haul away your containers, it makes them easier to handle and causes less damage to the environment. 3. Keep recyclable waste separate: It is a smart idea to separate waste that can be recycled from that which cannot. It makes it easier for waste collectors to manage them and you make sure that you do your bit in protecting the environment. 4. Separate hazardous waste: Many household waste materials are hazardous. It is important that you keep these materials separate from non-hazardous waste. This prevents any possible dangerous chemical reaction or explosion. You also make sure that materials contaminated by hazardous waste are not made unrecyclable. 5. Find out waste management regulations: To make sure that you are not heavily fined for improper waste management, gather information regarding regulations in your area. Once you have done this, it will be easier for you to remember what is and is not permissible and avoid mistakes that could result in heavy penalties and fines. To make sure that your waste is managed and disposed of in the proper manner, it is best to hire professional waste disposal services in London. These services adhere to all rules and regulations regarding waste management and disposal. This means that you do not have to worry about whether your waste is being disposed of safely. 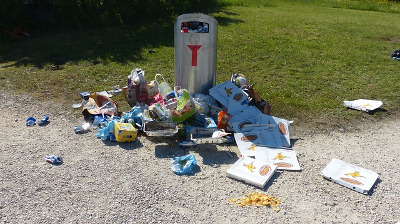 Waste management fines can be heavy and you can end up paying a hefty sum for not taking proper care of your garbage. To avoid paying these fines, follow the tips mentioned above and always keep yourself well-informed on new rules and regulations regarding waste management in your area. This entry was posted in "Waste Management" on Tuesday, November 25th, 2014 by 24/7 Waste Removal.